The news hit me like an electric shock. Was this for real? I stared at the words on the TV screen in disbelief—President Obama Says All U.S. Troops in Iraq Will Be Home by the End of the Year. That meant that 41,000 troops will be leaving Iraq. This welcome announcement was somewhat tempered when further reports revealed that on January 1, 2012, the State Department will command a hired army of about 5,500 security contractors, all to protect the largest U.S. diplomatic presence anywhere overseas. There will also apparently be a “significant C.I.A. presence,” according to the New York Times. What was I to make of that? Since the fall of 2003, my anti-war grandmother friends and I had been struggling, demonstrating, petitioning, organizing, yelling, marching, traveling with one singular objective—to end the illegal, immoral war and occupation in Iraq causing so much death and destruction. We later added ending the war in Afghanistan to our agenda. When we first hit the streets, we were a small minority and met with anger. Most Americans backed the war. CNN promoted it like it was the latest blockbuster action movie, and the public cheered as the news channel repeatedly showed the fires ignited by our bombs lighting up the Baghdad sky. I began Grandmothers Against the War with a vigil in front of Rockefeller Center with just two of us nervous, shivering old ladies on Jan. 14, 2004. Gradually, more and more people joined us—mostly grannies, but also Veterans for Peace and other lone individuals sick about the war. We endured hecklers who would shout such things as “Traitors” at us. One of our Vets for Peace almost got into a fist fight with a particularly obnoxious and persistent passerby. But, we kept on, heartened that more and more of the crowd gave us thumbs up and yelled “thank you” as the public began to realize what a debacle our occupation was. Foreigners, in particular, applauded us—an Italian man came over to us one day and kissed all 24 grannies standing there on the cheek. We decided to ramp up our opposition when we became aware that the Bush administration was impervious to the growing public outcry to end the war. Eighteen grandmothers, me included, tried to enlist at the Times Square recruiting station on Oct. 17, 2005, in order to replace young people in harm’s way for a lie. Actually, none of us had grandkids in the military. We did it as a matter of principle on behalf of America’s grandchildren. We figured they were entitled to long lives like we had all enjoyed and should not be forced to endanger their lives and limbs for an unjust cause. When we were denied entrance into the recruiting station, we sat down on the ground and refused to move. The police arrested us and took us to jail. We knew we were entitled to peaceably dissent, but the cops apparently didn’t! After a six-day trial in criminal court, defended by eminent civil liberties attorney Norman Siegel and his co-counsel Earl Ward, we were acquitted. The resultant world-wide publicity put the peace grannies on the map, and I like to think that our action was perhaps the first significant anti-war protest with legs. And, that was just the beginning. We launched a mind-boggling series of actions and never paused—even just last week, the Granny Peace Brigade, an outgrowth of Grandmothers Against the War, held a silent vigil at Lincoln Center which received wide attention from the media. Over the years, we went on a ten-day trek to Washington DC, traveled abroad to speak before peace groups, sent 100 grannies to lobby 100 U.S. senators, orchestrated colorful marches across Brooklyn Bridge, performed a whole show written and performed by us and did numerous other creative actions (it’s all chronicled in my book, Grandmothers Against the War: Getting Off Our Fannies and Standing Up for Peace). I must say, painfully, that though I enthusiastically supported Pres. Obama during his election campaign, I became disillusioned and disappointed at his failure to bring our troops home from both Iraq and Afghanistan. At times as I stood in front of Rockefeller Center, often in heavy rain or blazing heat, I would wonder if there was any point in putting myself through such discomfort. I began to feel discouraged and doubted these wars would ever end in my lifetime. I fully expected to be out there standing on Fifth Avenue until the day I died. But, now, with this hopeful and unexpected news, I feel that perhaps it’s all been worthwhile. I like to think our granny efforts have been part of the pressure that contributed to Obama’s decision. I don’t know the political maneuvers behind his move—maybe it has to do with tangled foreign policy machinations I can’t begin to understand. Maybe it’s designed to help him get re-elected. Or maybe—just maybe—he did it out of sheer moral principle. I like to think that is his main reason, anyway. Of course, the more urgent matter is Afghanistan. He says he will bring them home soon. My long immersion in the anti-war struggle, however, has taught me that we can’t count on his doing so unless we keep the pressure on him to end that occupation as well. It will inevitably end some day, but more quickly if we stay mobilized. We can’t clap our hands with joy, unfortunately, until it does. For now, I will be cautiously optimistic. Dare I say “Mission Accomplished” in Iraq, with reservations, as far as the peace grannies are concerned? 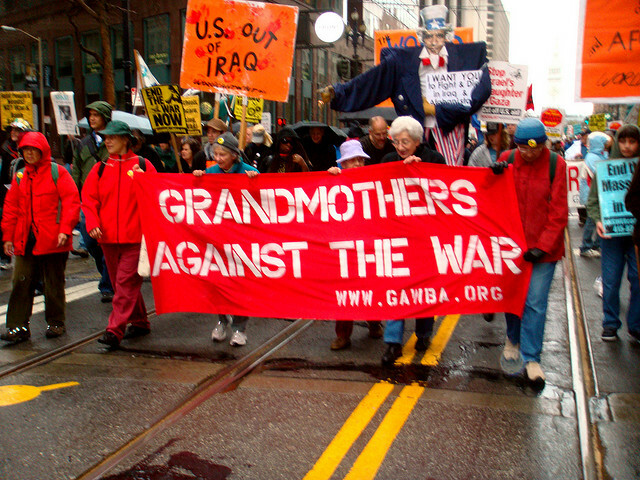 Joan Wile is a grandmother of five who founded Grandmothers Against the War eight years ago.